At ely, we trust our friends and long-time suppliers, Sheridans Cheesemongers, to guide us when it comes to serving a great cheeseboard to our customers. When you’re putting together a cheeseboard, the general idea is to serve a selection of cheeses which will offer you and your guests contrasting flavours and textures. Try to buy where you can taste; your eyes will never tell you as much as your taste buds. Ideally, mix a nice soft cheese, a blue cheese, a hard cheese, a washed rind cheese (they’re the smelly ones with the pinkish rinds), and if possible, a sheep’s or goat’s milk cheese. But remember, it’s better to have one ripe and gorgeous cheese than five mediocre pieces. Ideally, buy your cheese from someone who has cared for it properly, then serve that same evening. 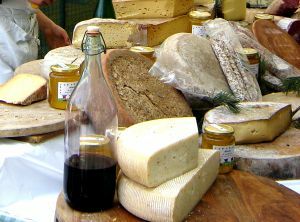 Cheese that you can’t use the same day can be stored in an unheated room or garage, though fridges are not as bad for cheese as they are sometimes made out to be. The main problem is their dry atmosphere rather than the cold temperature. If you do store your cheese in the fridge, always remove it several hours before serving. Make sure your cheese is well wrapped in a breathable covering such as wax paper. This is particularly important for cheeses with mould or culture rinds and fresh goat’s cheeses; plastic will suffocate them and often cause ‘off’ flavours. There are no set rules for serving your cheeses; some people like to have their cheese before dessert and others prefer it after, or instead of, dessert. I think it is good to serve something with the cheese which will act as a foil against any richness and clean the palate between cheeses. Fruit is really good for this; a fresh pear or apple is ideal. The fruit must be ripe though, so if you don’t have any to hand, serve a chutney, fruit jelly or dried fruit. Cheese is a wonderful food and needs very little preparation. Everything depends on the quality of the cheese you source. So take your time, seek out the best and enjoy!